RkBlog :: What is better - short exposures with high gain or longer exposures with lower gain? What is better - short exposures with high gain or longer exposures with lower gain? Ultrafast planetary imaging is a topic that gets more and more popular when new ultrafast planetary cameras enter the market. Some may thing that recording at speeds faster than 100 FPS could be a big advantage over more common 60-30 FPS speed ranges. Lets take a closer look at such imaging - at very high gain with very short exposures at high framerates. Is gain good or bad? Gain value is a multiplier. It will multiply sensor signal values to our numeric image scale (0 black, 255 white for a 8 bit capture). Some gain value is needed to map sensor signal to that scale in an optimal way. To low and we will get quantisation errors - where different sensor signal get the same result value causing artefacts like onion rings to show up. Very high gain is also a bad thing. It will require much shorter exposures to fit the planet signal on the scale. At shorter exposures planet signal level gets closer to noise signal level and thus very high gain values will easily expose camera noise. Extreme gain values are things to avoid. 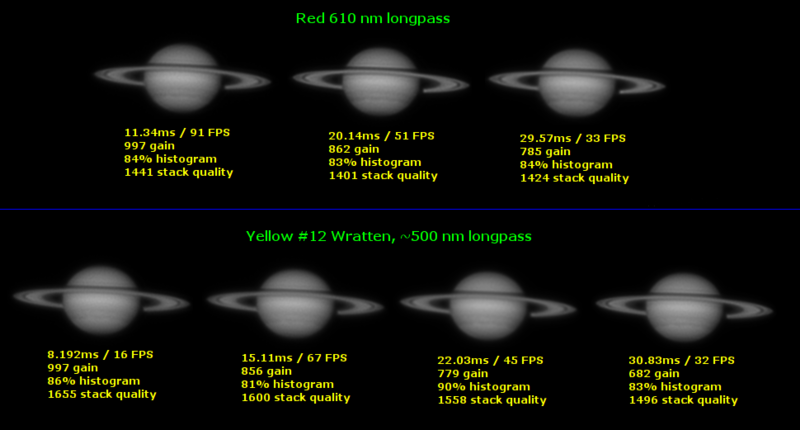 Nowadays planetary cameras can easily exceed 100 FPS, some are even rated at 500+ FPS. Imaging at such high speeds give us much more frame in the same amount of time when compared to slower cameras. It could look like a pure win-win for faster cameras but it isn't like so. Stacking improves singal to noise ratio by a square root of stacked frames. We get 31,6x for 1000 frames, and 70,7x for 5000 frames. Faster camera will give more frames to stack but many people miss one thing - the base image signal to noise ratio. High gain short exposure image will have low SNR ratio, while low gain longer exposure one will have higher. The low SNR will need much bigger improvement to give good final image, while the base image with good SNR will need lesser improvement to give good result. We get a clash of two settings - will the fast camera provide enough frames to counteract lower base frame SNR? To solve such question we need to do some experiments and analyse the result. Every photographer can do an experiment that will answer which settings path is better for his equipment and processing - just shoot multiple AVIs at various gain / exposure time with similar histogram fills. Then process them and compare results. I did similar tests some time ago for a fast Basler Ace camera equipped with ICX618. You can check first, second and third comparison for Saturn, and one for Jupiter. Aside of noise this camera had problems with sensor artefacts at high speeds - ICX618 isn't designed to work at very high frequencies. The ASI comparison as well previous ones show that in general shortest exposures at max or nearly max gain are more noisy than the low gain shots. The last ASI image taken at 45ms exposure shows that seeing is starting to de-freeze and blurs fine detail a bit (you don't need to go very short with the exposure to freeze it). 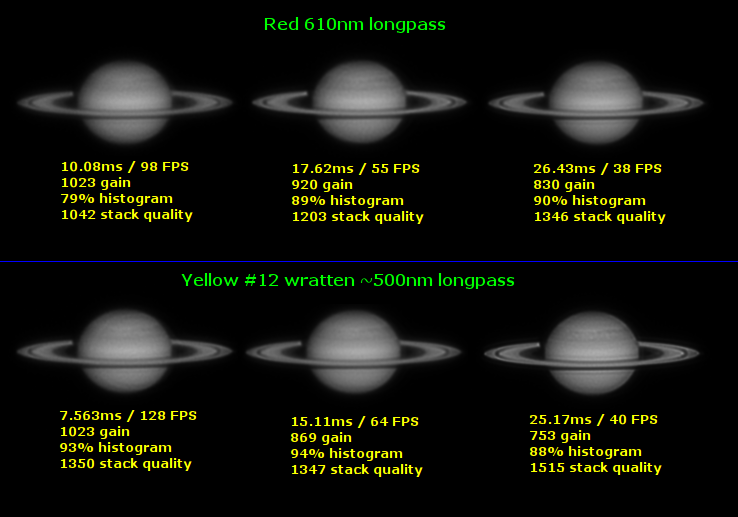 I usually use up to 30 ms for Saturn, and less for brighter planets like Mars or Jupiter (65-50 FPS). Those settings seems optimal for me. Although my results show repeatable pattern there are images on the web taken at ultrashort exposures that do look good. There may be camera/equipment/processing combinations that could benefit from such settings - so go out and test it as much as possible - picking ultrafast camera may or may not be good for you. I wrote about SNR improvements from stacked frames count. Having FireCapture noise levels I've decided to do some cheese calculations (theoretical). In theory the 40% gain recording gave 2.6 times lower SNR on the final image than the ultrafast one on 100% gain. Note that cameras don't like theories and the actual results may vary greatly. That's why it's always good to test and experiment.